I have recently read an interesting news in internet..
A person decides to travel round the world. Do you know what for? 'All are saying God is present... He wanted to know in which country that God is living.' As per his itinerary, he went to a country in search of God. There a board was hanging in a shop. In that board it was written 'you can talk to God over the telephone and there is facilities for that'. He was surprised and entered into that shop and enquired, how much was the telephone charge for that? The shop keeper replied it is ten thousand dollar. That person said 'no', and took a flight for the next country. Likewise there also in the entrance of a shop a board was hanging indicating 'to speak to God eight thousand dollar'. He felt that it was also too much and returned. Further, he was not able to talk to God though he traveled too many countries, as the demand was too much. Thereafter, in search of God he came to India. In a poorly maintained shop there was a board hanging 'Here you can talk to God'. The amount for this was not mentioned. With great curiosity he asked the shop-keeper how many dollar will it cost? The shop-keeper, with a smile replied 'No Dollar... No Ring. It will cost only one rupee like a local call'. With surprise he asked the shop-keeper 'to speak to God only one rupee?'. The shop-keeper replied in the affirmative and added 'that this is the country where God is living. Here by making a local call we can talk to God. In such a sacred country, I have the opportunity of propagating the importance of spiritualism, the living God namely Kanchi Maha Swamigal and the fame of Guru both in this country and abroad and I am thinking that this is a boon for me on account of the good deeds that i have done during my previous birth. 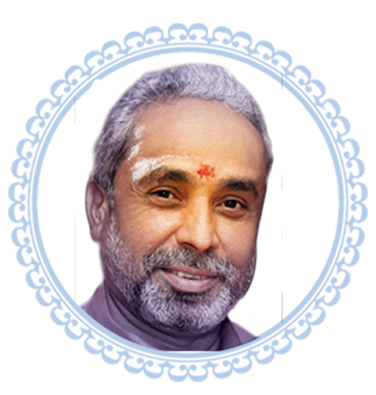 To know about me, my programmes/discourse, the books that i have written so far and my address you can visit this website (pswaminathan.in). All my acts and deeds are by the blessings of my family deity Siruvachur Sri Madhurakali Amman and by the grace of living God HH Sri Kanchi Maha Swamigal. I pray for the blessings of the God and the grace of Kanchi Mahan be showered on you all. .